You can’t beat the views, location, configuration, amenities and price of this modern fully renovated 3 bedroom + loft, 3 bathroom townhome at 2385 Good Trump Ct in lower Deer Valley. Just walk out the front door and catch the free Deer Valley shuttle to the #1 ranked ski and summer resort in the world, or take the free Park City bus to Main Street for shopping, dining and entertainment. This property was designed as a private get-away and exclusive vacation rental. No expense was spared in the fit, finish, and furnishings of this property. Just check out the previous and repeat guest reviews below, this townhouse is a gem! From a fully equipped custom kitchen and bar, to a spacious great-room with cozy Fireplace and large entertainment system, work desk area, dining room with ample seating, private Hot Tub, outdoor BBQ, and extensive sleeping quarters - this property has it all! The main living level has two Master Bedrooms, both with a King bed, flat screen TV and private en-suite bathroom with custom heated flooring. The entry-level has a large bunk room with one Queen and three Twin beds, flat screen TV with Sony Wii game system and a private en-suite bathroom with bathtub/shower combination, perfect for a 3rd couple and lots of kids. There is also a loft, accessed by ladder with a Queen bed for a 4th couple or even more kids. This home has 7 beds and can sleep 11 comfortably. To top it all off, there’s a private heated garage with ski & snow board racks and room for a full sized SUV, as well as parking for a 2nd and 3rd vehicle in the private driveway. Twin inflatable bed with linens available upon request. No Pets: No pets are allowed in or around the house at anytime. No Smoking: No smoking is allowed in or around the house at anytime. Occupancy and Vehicle Limit: A maximum of 11 people are allowed to be in the house at anytime. No more than 1 vehicle per 5 guests is allowed at anytime in the garage or driveway. There is no street parking allowed. No Parties/No Events/No Large Gatherings: Absolutely no house parties, no events or no large gatherings. If a house party attempts to occupy the property, the group and Tenant will be evicted and all monies will be forfeited. No loud music will be tolerated, and all music should be turned off by 10 pm. Slippery and Icy Conditions Exist: The driveway will be plowed and the entry will be shoveled after it snows, but there still exists slippery and icy conditions, including roof snow and icicles. No Equipment in the House: Please keep all skis, snowboard, poles, bikes and equipment in the garage. Governing Laws: Guest agrees to abide by the laws, rules and regulations of the governing jurisdictions. You can’t beat the views, location, configuration, amenities and price of this modern fully renovated 3 bedroom + loft, 3 bathroom townhome at 2385 Good Trump Ct in lower Deer Valley. Just walk out the front door and catch the free Deer Valley shuttle to the #1 ranked ski and summer resort in the world, or take the free Park City bus to Main Street for shopping, dining and entertainment. This property was designed as a private get-away and exclusive vacation rental. No expense was spared in the fit, finish, and furnishings of this property. Just check out the previous and repeat guest reviews below, this townhouse is a gem! From a fully equipped custom kitchen and bar, to a spacious great-room with cozy Fireplace and large entertainment system, work desk area, dining room with ample seating, private Hot Tub, outdoor BBQ, and extensive sleeping quarters - this property has it all! The main living level has two Master Bedrooms, both with a King bed, flat screen TV and private en-suite bathroom with custom heated flooring. The entry-level has a large bunk room with one Queen and three Twin beds, flat screen TV with Sony Wii game system and a private en-suite bathroom with bathtub/shower combination, perfect for a 3rd couple and lots of kids. There is also a loft, accessed by ladder with a Queen bed for a 4th couple or even more kids. This home has 7 beds and can sleep 11 comfortably. To top it all off, there’s a private heated garage with ski & snow board racks and room for a full sized SUV, as well as parking for a 2nd and 3rd vehicle in the private driveway. For a remarkable five years running, Deer Valley has been named the #1 ski resort in North America by the readers of SKI Magazine including 2012. Within a ten minute radius, we have access to the finest ski resorts, dining, shopping, and nearly every recreational activity one could imagine. We chose the location of our property near Snow Park Lodge because of its easy proximity to resort, town, and nearly door-to-door highway driving from SLC. Deer Vally is a short walk, door-to-door shuttle, or drive from the house. Park City Resort and Canyons are also an easy shuttle or drive. Sometimes, we drive to Alta, Solitude, and Snowbird in search of late season powder in less than 45 minutes. The quite setting in a residential neighborhood away from a major thoroughfare also makes it a great place to relax with friends and family without the city noises you left behind at home. This is truly a special place. Well set up place for 2 families. Great location for deer valley skiing. Would have given 5 stars except the balcony with hot tub and bbq had a large mound of snow on it, that we need to work around to be able to access HT & BBQ. Mom with 5 teenage boys loved this place!!! Wonderf home and location! Well stocked with kitchen and laundry supplies and games and books. Super easy home to live in. Fabulous light! Great deck with clean hot tub with beautiful views! 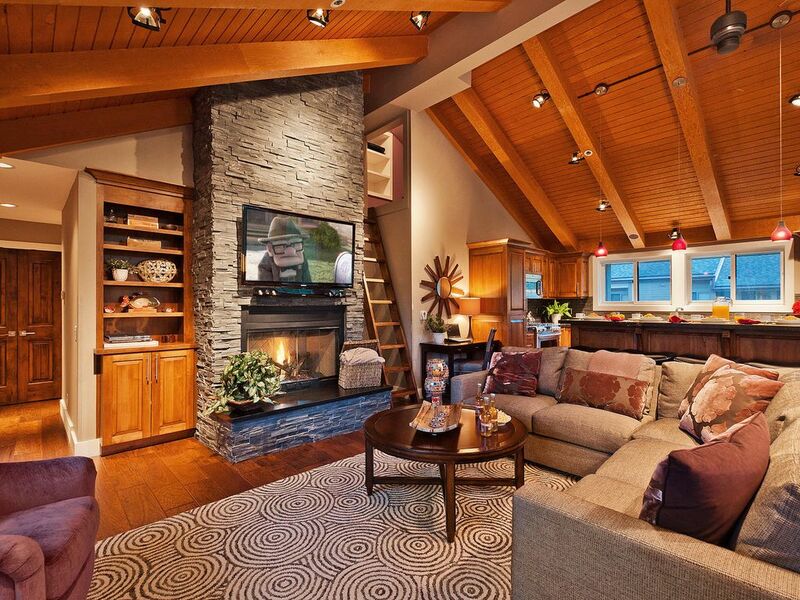 We loved this beautiful Deer Valley home! Two families stayed here.... 4 adults and 4 kids and it was perfect. Great location. Bo was great. Will definitely recommend. Our little guys first time skiing!! This was a prefect place for us to stay to take our little ones skiing for the first time. We skied at Deer Valley. House was prefect. There ended up being 7 of us and we all slept well. Hot tub was a huge plus. And heated floors in the bathrooms was a nice surprise. The shuttle picks you up right outside on the corner every 15-20mins. House was great for a family ski trip- accessible to the slopes and ski school, and very comfortable and clean. Bo is super responsive!